Eizi Hirota, author of the present paper (pp. 841-849), extends the classical view of chirality by introducing a quantum-mechanical treatment of molecular motions in the field. 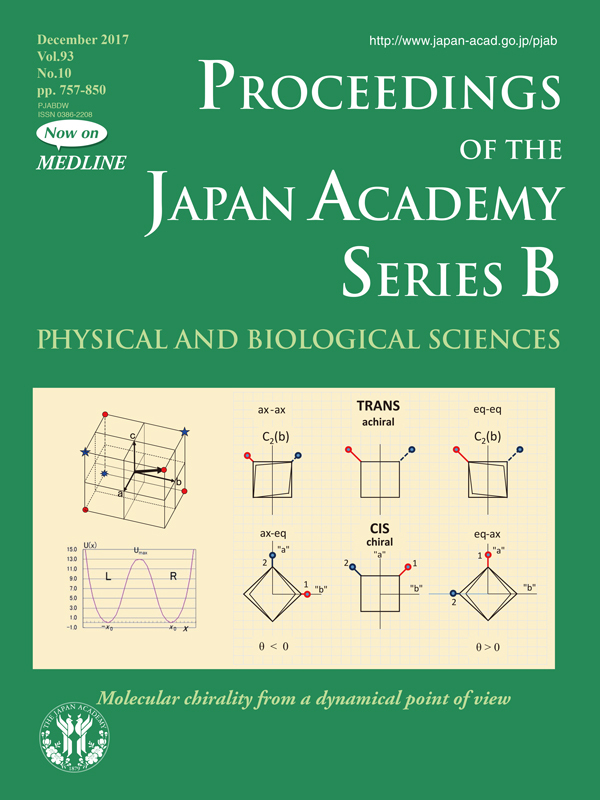 The upper-left figure displays a C1 chiral molecule (one without any symmetry elements) by a rectangular parallelepiped, the edges of which are chosen to be proportional to the electric dipole-moment components. An enantiomer occupies a red point in the front corner, while the other in the opposite corner designated by a double star. The two points actually correspond to two equivalent potential minima, L and R, separated by a barrier, Umax, as depicted in lower-left figure, i.e. a double-minimum potential (DMP). A few types of molecular motions with a DMP are well known; examples of low frequency and/or large amplitude include inversion, internal rotation, and puckering, which often result in pairs of equivalent potential minima, which can be regarded as enantiomers. 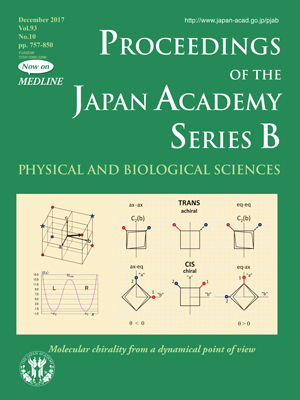 Spectroscopic studies have already been extensively carried out on those molecular motions, and the achievements obtained by these studies could be extrapolated to many systems where the motions are quite low in frequency because of heavier and/or larger substituents, making the enantiomer pairs sufficiently stable. The right figure represents an example of puckering; cyclobutane-1, 2-d2, trans and cis. Trans exists in either axial-axial or equatorial-equatorial forms, which are distinct and thus achiral, except for cases where the potential barrier to puckering becomes infinitely high. In sharp contrast, cis takes a conformation either axial-equatorial or equatorial-axial, which form a chiral pair. In fact, a number of photocycloaddition reactions have been known to produce chiral molecules, whose central backbones consist of a cyclobutane ring. The present study suggests that a possible bridge may be formed between asymmetry synthesis and spectroscopy of low-frequency and/or large-amplitude motions.